I still remember the thrill of my very first Chinese meal, in a restaurant in exotic St Albans back in the late eighties. There were banana fritters and hilarious chopstick lessons, pancakes you could eat with your hands and carrots carved to look like flowers; in short, it was an eight-year-old’s dream meal ticket. My tastes have changed slightly since then – I’m likely to be the one pushing for the pock-marked Mother Chen’s bean curd, or the chilli tripe (while secretly hoping someone else will insist on the crispy duck), but one thing I’m unable to resist, if it’s on the menu, is salt and pepper squid. And it usually is, because whatever part of China they’re from, restaurateurs are canny operators, and Cantonese spicy, salty fried food is always a winner. The problem is, Chinese meals are all about sharing, and even people who claim to be scared of tentacles usually end up polishing off more of the portion than I’m strictly comfortable with. 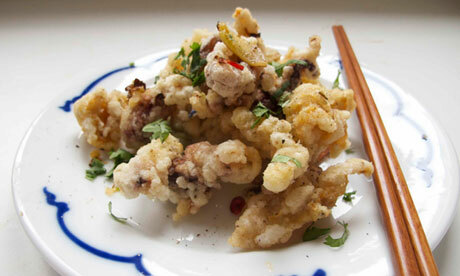 Time to make squid the main attraction at home, away from prying chopsticks. British squid is easy to come by in fishmongers – recipes vary as to the preparation method, with chef Ching-He Huang and Mitch Tonks recommending they are cut into rings, and most others suggesting triangles. I find these larger pieces hold the batter better, as does scoring one side in a diamond pattern, as suggested by Bill Granger and Rick Stein. (This is also supposed to stop them curling up quite so much during cooking, although it doesn’t make a huge amount of difference when deep frying.) Baby squid are preferable if you like to crunch the tentacles as well (many people are squeamish; I think they’re the best bit). Not everyone is keen on a bit of batter: Rick Stein stir-fries his squid naked, but, pleasant as it is, it’s missing the crunchy element that makes salt and pepper squid such pure joy to eat. The other recipes I try are more traditional. Sydney chef Ying Tam makes a batter from self-raising flour, vegetable oil and water, which wins the crunch competition, while Huang’s egg and potato flour coating in her book China Modern is the lightest, and gives the best coverage. Of the also-rans, Bill Granger uses cornflour and soda water, which makes it crunchy, but relatively heavy, and Tonks’s milk and cornflour coating, from his book Fish Easy, disappears into the fryer, never to be seen again. 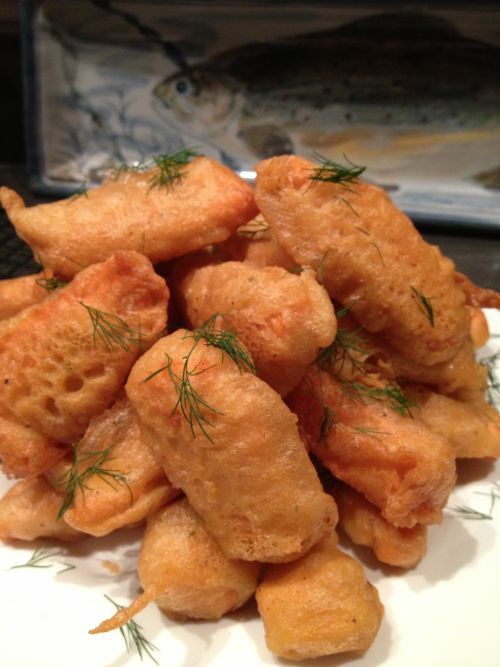 Potato flour and egg seems to be the wise choice here – almost tempura light, it comes closest to the real thing. Batter’s only a convenient vehicle for spice, however – and, for a dish with such a self-explanatory name, there’s a remarkable diversity of opinion here. Huang and Granger are the only ones who really adhere to the description, although she uses white pepper and he goes for black. Stein and Tonks are faithful in a slightly fancier way, using a mixture of black and tingly, numbing Sichuan peppercorns, dry roasted until fragrant, which I love – the combination gives the batter a more assertive, complex peppery flavour. Tonks also chucks in some dried Sichuan chillies, but I decide to reserve this heat for the topping (of which more below). I like his idea of reserving some of the seasoning mixture to sprinkle over the cooked squid just before serving, however, so the dish packs a little extra punch. Tam, meanwhile, goes completely off piste with a homemade “five-spice mix” of ground ginger, celery powder, salt, five-spice and chicken stock powder, which, according to my culinarily sophisticated boyfriend “makes it taste like Pot Noodle”. Whether or not that’s true (of course, I wouldn’t know), it certainly overwhelms the flavour of the poor squid. Actually, for salt and pepper squid, this is more than a mere garnish: the little crunchy morsels of fried chilli and onion that can be chased around the plate with chopsticks long after the last tentacle has been devoured are crucial, and nice as it is to have a spritz of lime juice and a sprig of coriander for freshness, I think Tonks is missing a trick by leaving them out. Sprinkling them on fresh, as Huang does, is also unsatisfactory – they should be cooked briefly, just to slightly caramelise them. That said, I find it well-nigh impossible, not to mention hazardous, to fish tiny pieces of chilli out of a pan of sizzling oil, as Tam suggests, so I’m going to cook them in a separate pan, and combine the two just before serving. He adds garlic, which I really like, but it has a tendency to burn, so keep it in slices, rather than chopping it finely. His final spritz of rice wine adds a pleasant zing to the dish, cutting through the fat, but I prefer the fresher flavour of the lime used by Tonks and Grainger, especially at this time of year, when you might even fancy yourself sitting outside on the waterfront in Stanley, Shanghai or Sydney as you dine in the garden. Sadly, this is a dish whose deliciousness largely relies on deep frying. OK, Stein shallow fries his, but then, as we’ve discussed, that isn’t quite the real deal. You can be all authentic, and do it in a wok, as most recipes suggest, but a deep pan will do just as well – or, of course, be like a real Chinese restaurant and use a deep-fat fryer. Serve with a salad, to slightly mitigate the guilt. Meanwhile, dip the squid pieces in the egg, then in seasoned flour until well coated. Fry – in batches if necessary – until pale golden, stirring once to make sure they don’t stick to the bottom. As they’re cooking, heat a further tablespoon of oil in a frying pan over a high heat. Use a slotted spoon to lift the cooked squid on to kitchen towel and tip the chilli, spring onion and garlic into the frying pan. Fry very briefly until it all starts to caramelise, then add the squid to the pan and toss together. Is salt and pepper squid your favourite Chinese takeaway treat, or would you make a case for prawn toast, wontons, or some more exotic fare? And, while we’re talking squid, what else do you like to do with them and their tentacled relatives, the cuttlefish and the octopus?